← New Publishing Schedule for the Bulletin! It should go without saying that the massacre of journalists and police officers in Paris this past Wednesday is abhorrent, that the perpetrators should be brought to justice, and that measures should be taken to reduce the likelihood of such a thing happening again. It should also go without saying (though it rarely does) that responses such as these are part of complex social realities that include competing interests and ideals, and are thus, by themselves, little more than empty platitudes. As with any trauma that gains widespread attention and rises to the level of a “flash-point event,” the discourse that follows in its wake is never just about the incident at hand, but an open wound that tends to reanimate old arguments while creating new facts on the ground that will reconfigure this terrain, in both predicable and unpredictable ways. In France, for example, there have already been a number of attacks on mosques, while there is speculation that this incident will help to bolster the far-right Front National, led be Marine Le Pen, with likely implications for immigration policy and a surge of xenophobic nationalism, which is on the rise in many parts of Europe, as seen with recent rallies by PEGIDA in Germany. Less obvious are the ways in which dominant narratives coming out of the Euro-West will play out, how they will condition certain responses over others, and provoke reactions from many sides. In what follows, I will briefly explore the use of freedom of expression/speech as a primary filter through which this incident has been interpreted, followed by some thoughts on the prohibition against depicting the Prophet Muhammad among many who identify as Muslim. 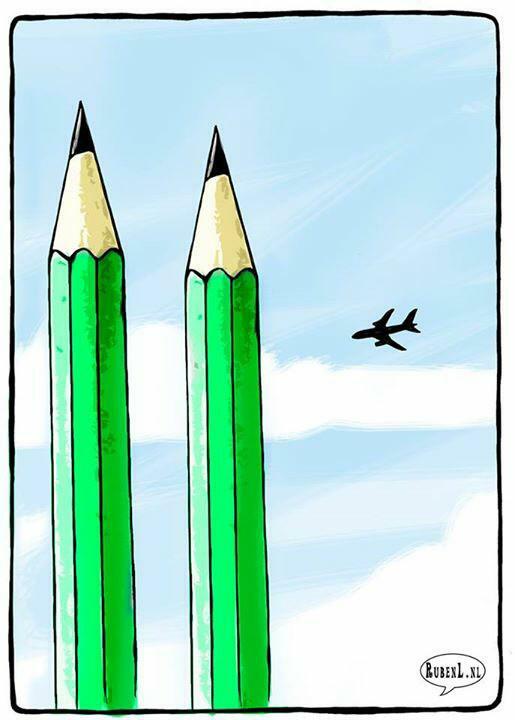 I wrote a short piece on Charlie Hebdo in September 2012, in light of the (now late) editor Stephane Charbonnier’s decision to publish a number of incendiary cartoons of the Prophet Muhammad. In this post, I was particularly interested in Charbonnier’s defence of his decision as a matter of “freedom of expression” and his observation that it is only Muslims’ who react violently to the publication of offensive images, noting how the Catholic Church responded to Charlie Hebdo’s provocations by filing law suits. The implication, in case it needs to be underlined, is that there is something distinct about “Islam” that brings about violent reactions and that it is incompatible (or at least at odds) with the values of Western civilization. In the wake of this most recent tragedy, the idea of freedom of expression has taken on much deeper contours, as seen with the popular meme “Je Suis Charlie” (“I am Charlie”) in cities all over Europe, and the outpouring of cartoons from satirists around the world (as seen with the image to the right). While meaning is never singular and will always be subject to contestation, the overarching sentiment in these popular images seems to be a blend of sympathy with the victims coupled with an identification of their values as “our own,” meaning those in Euro-Western democracies. As some have pointed out, Charlie Hebdo’s depictions of the Prophet Muhammad are not only offensive to many Muslims as mere images, but also play on racist stereotypes that could be considered hate speech and would likely gain wider condemnation if they featured blacks or Jews. Here I would suggest that part of the reason that such racialized images go unrecognized by many, including self-professed liberals, has to do with the widespread association of “religion” with “belief” and the concomitant reduction of causation in this case to the matters of blasphemy or offence, which, in turn, prompts the reaction to defend freedom of speech and expression. This is the very stuff that ideology and grand narratives about cultural identity are made of. While Brown goes on to critique Marx’s theory of religion, her point is to show that “criticism” (as defined above) reflects a reactionary response that tends to argue the opposite of some idea in typical binary fashion, as though that is all that is at stake, versus “critique” as a commitment to theoretical analysis of the larger field of play. As obvious as this may sound, I would claim that this distinction marks a key difference between the role of the pundit versus the task of the scholar (and critical journalist), whose goal it should be to problematize conventional wisdom and point toward the various ways that such regimes of logic narrow conceptual possibilities, marginalize certain groups, and uphold identities that effectively mask the hegemony of their own ideologies. Although Cole’s argument requires much more empirical verification and makes the problematic claim to know the attackers’ intentions, his analysis approaches the domain of what good critical theory should do—that is, move beyond the expressed intentions and beliefs of the assailants as an explanation for what caused this event toward an analysis of the material conditions (historical, political, socio-cultural, etc.) that produce such things in the first place. Whereas Asad’s point is to question Western liberal notions of freedom and autonomy by showing how events such as these are interpreted by Muslim authorities in ways that are both particular to Islamic cultures and different from common Western stereotypes, Mahmood draws attention to how “cultural and ethical sensibilities” (83) are variously understood and negotiated amongst (some) traditional Muslims living in the Euro-West, with the intention of opening up the conversation toward certain insiders’ points of view. In the near-decade since the Danish Cartoons affair there seems to be little movement in the direction of broadening public discussion on the various positionalities of Muslim identities, and instead a doubling-down on well-worn tropes about “Western civilization” that promises much of the same. This entry was posted in Matt Sheedy, Politics and Religion, Religion and Society, Religion in the News, Theory and Method and tagged Abu Musab al-Zarqawi, Al Qaeda, Catholic Church, Charlie Hebdo, Daesh, Danish Cartoons, Front National, ISIL, ISIS, Je Suis Charlie, Juan Cole, Judith Butler, Karl Marx, Marine Le Pen, PEGIDA, Prophet Mohammad, Saba Mahmood, Shiite, Stephane Charbonnier, Sunni, Talal Asad, Ted Cruz, The Onion, Webb Keane, Wendy Brown. Bookmark the permalink. What irks me in all the “coverage” is the insistence on using the newsspeak of “terrorism,” “Islamicist,” and “democracy.” How would we all react if we reported this as murder rather than “terrorism”? How would the claim that individuals intolerant of free expression – in this case satire – eliminated their discomfort with mass execution? Or hoped to increase the membership in a group dedicated to violence with such an action? What if we read that capitalist governments who manipulate information all the time for their own purposes are exploiting this event to make hypocritcal statements about “democracy,” “freedom,” and “our values”? I am trying to make the point, as Huxley did, that newsspeak muddies our thinking and obscures those things we might need to attend to. Nevertheless, i still agree with Voltaire.